My arrival at Mustang Maniac this week was a bit of a shock, as my car had gone. Not stolen or anything like that of course, but the car was not in the garage where it usually is. I had a wander around trying to find it, often interrupted with Adam or Yogi laughing while moving lorries around shouting “You found your car yet?” I knew it the was there somewhere due to the extra work they had been doing in my absence. I eventually found it in a workshop stored next to very well know celebrity’s car all covered up. I bought a cover for the car a couple of weeks ago from Adam to keep it clean rather than the static sheet. Now I’m not sure what the guys had been making their tea with but they were laughing at the “Enos” sticker stuck on the cover. I must explain that “Enos” is Adam’s budget range of parts. To see budget on my car just cracked me up and few words were uttered, but it was a very funny few moments. The guys had taken the car off the ramps as they needed to get another car up there and my car also needed to have the steering and suspension geometry set up, so it was perfect timing to be fair. The guys managed to set up the geo up after a bit of work with the shims and drove it to the storage shed ready for my visit. 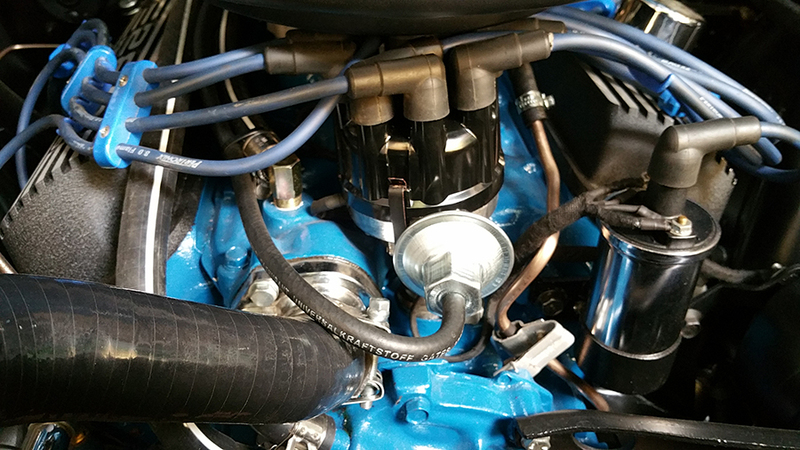 The guys contacted me during the week to say that they had tried to sort out the erratic running of the engine on idle which was pointing to the carb. They tweaked it as much as they could, but it was still not quite right for Adam’s liking. 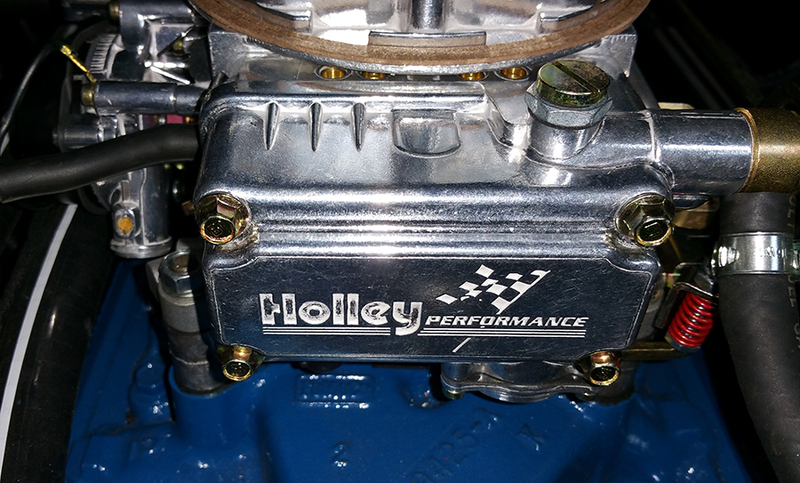 The guys took the old Holley apart and found there were some problems with corrosion and the seals. So the conversation wasa very short one and resulted in a new one, besides the new ones looks absolutely brilliant and better than my old one, a jewel in the crown as it were. This is the same capacity carb as my other one a 600cfm, but a more updated version of it. The vacuum advance pipe was looking a bit of a mess, so Adam gave me a new one. I offered the pipe up in position and the pipe was going to hit the Monte Carlo bar unless I bent it in strange positions to make it fit. 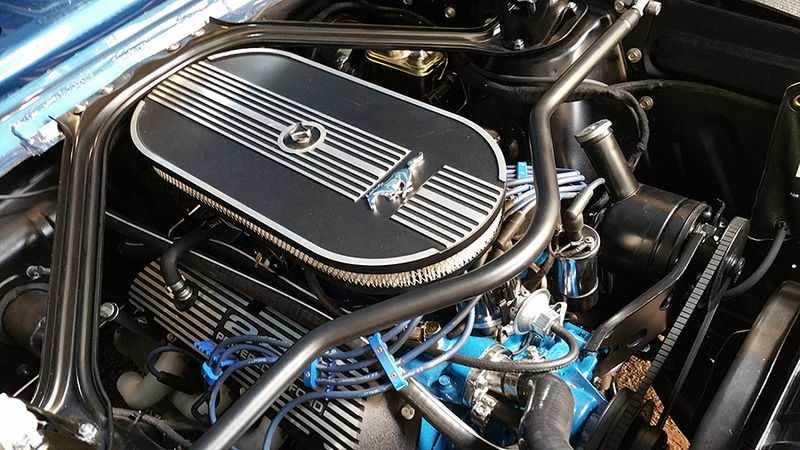 The decision was to replace the vacuum advance with a ’66 version where a rubber hose connects to the carb and the distributor. The only trouble is that I would have to remove the old vacuum advance valve and fit a new one. That caused a problem with the Pertronix ignition sensor on top of the distributor palte as it overhung the vacuum actuator arm, so it all had to come apart. 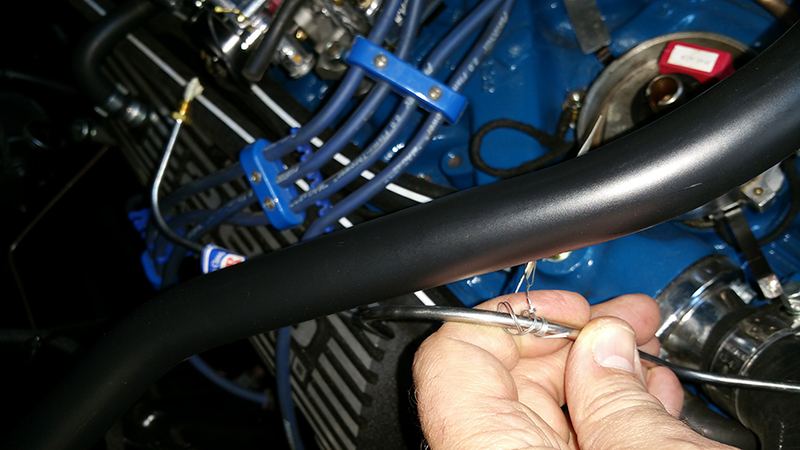 With the new vacuum valve in place, the gap had to be reset for the Pertronix ignition. The new distributor cap and rotor arm were clipped back in place, finally push on the rubber hose to the carb and the other end to the vacuum valve. A much nicer looking job I must say. With the engine now completed again except for the spark plug leads (which will be changed a little later), it was time to move on to something a little more bling. The problem here is that the I have a left hand drive car in a left hand driving country, in other words i am sitting next to the pavement. Mirrors on the Mustangs at this time were fitted with inside rearview and the driver’s side, which wouldn’t give me much visibility on the roads here. 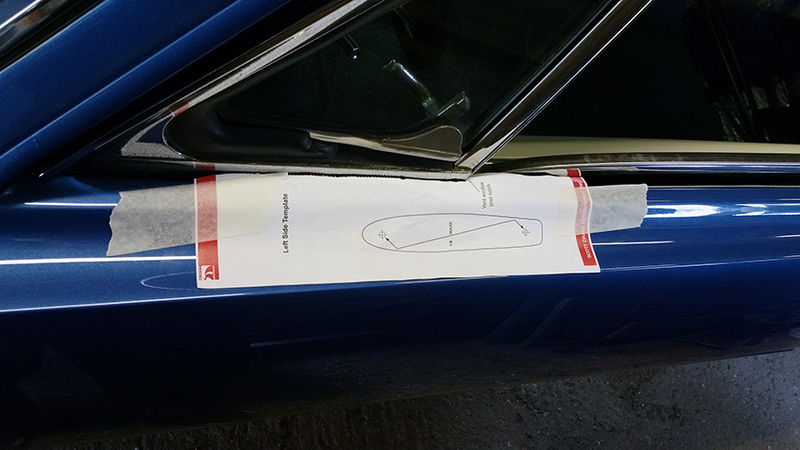 There was of course an option to have the mirror on the right hand side too as an option when the car was ordered. I decided that I would need to have both sides to be safe, so Adam got me a couple of door mirrors out which he strangely had sitting on the side ready. I picked them up and took the to the car and opened the box. Inside was the “show quality” mirror and a paper template which was really nice touch for both sides. I cut the templates out and stuck them to the top of the door where they should go. The templates even had tiny cut outs to fit exactly where the front quarter vents were. I stuck the templates down and looked for the drill. The holes were marked out for the drill locations. I dummy fitted the mirror just to make sure the vent opened and closed without issue which it did of course. Two holes were drilled and I sprayed an anti rust primer down the holes and wiped the excess away. Between the door paintwork itself and the mirror is a rubber/plastic type gasket. I applied a very thin layer of gasket sealer around the gasket to stop water (if any) running into the whole and making them rust out. Pressing the gasket down over the holes allowed the mirror to be screwed into place which then squashed out the excess gasket sealer. A little Gibbs and a lint free cloth wiped away the excess to leave a nice sealed black gasket that nobody can tell has been sealed at all, if that makes sense? The other box was upside down, I turned it over to find another of the pesky “Enos” stickers on my mirror now. God knows what they have been on today, but it was funny. I would like to point out at this point they are not the “Enos range” here, they are the “Show Quality” versions! The right hand side was repeated in exactly the same way and looked pretty cool with the mirrors on. Double checking that the front quarter vents clear the mirrors nicely, it would be a bit late if they didn’t to be honest as I already had drilled the holes. 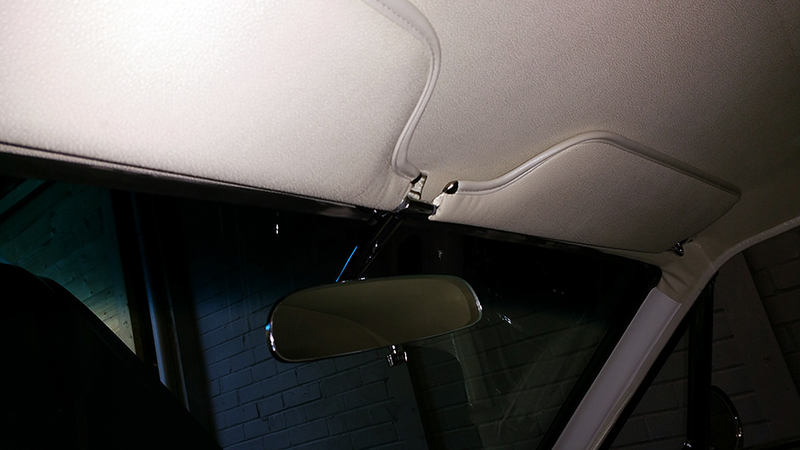 Inside was finished of by screwing in the rearview mirror which also houses the sun visor stops. The carpets were treated to some mats to stop the dirt from the yard, already that had started to do their job. They do look great with the pony logo embossed on them. Last job of the day was to put the wheel centre caps in place. You have to take the wheel off, screw in a plate to th centre cap and refit the wheel. I went for the plain Mustang logo which matched the wheels. 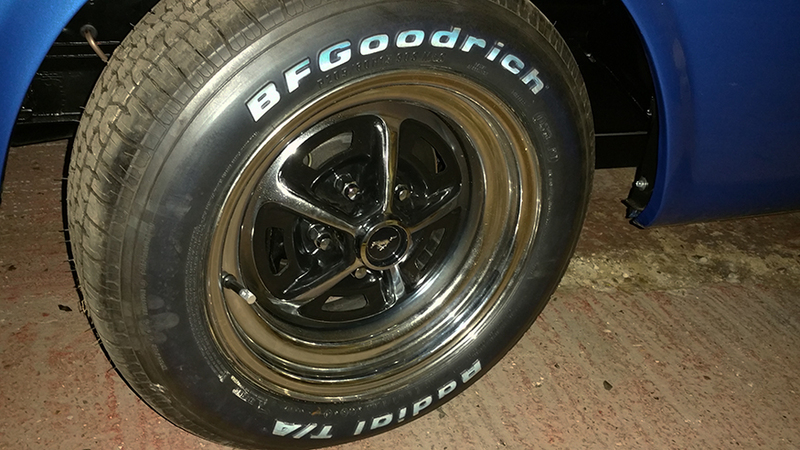 Of course I had to make sure the horses were all in line with the BFGoodrich White Lettering which I still haven’t cleaned up yet. All this work brought us to the end of the day where it was starting to get dark. Adam decided we should have an impromptu check of the lights. 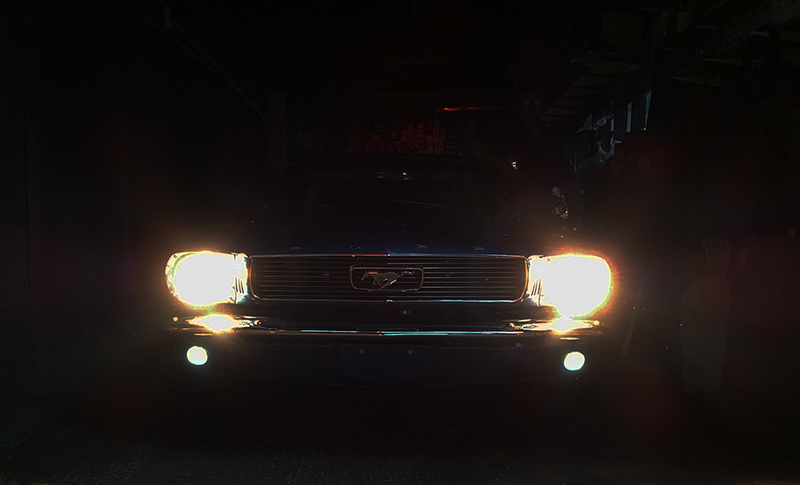 So I took a few pics with the park lights then the main headlights. I had a little play in Photoshop to make the effects look a little different. I was surprised to see just how much the rear LED’s illuminated the back of the workshop. From a couple of weeks ago I posted “Eye Candy” which showed how to fit the GT Dash into the car’s main dash. I have had a request since then if I can do a walk through for the process. I have split the process out into removing and refitting, then sub sections for various gauges and the process to fit or remove them under the “How To…” menu. Click here for the quick link. Over the years I have done a lot of work on the dash to get it looking how it should, so I have also got a link here on how to restore the dash gauge set and make an Ammeter to Voltmeter conversion. Click here for the quick link. While we are on the subject of requests I have been asked a number of times now about the Drum Brake Pliers I reviewed (Click here) from Sealey and how to use them. I decided to copy the usage diagrams and put them with the Tools Review menu. There are other tools out there that I would recommend over the Sealey tool but the Snap On tool is a lot more money. The majority of the general purpose Brake Spring Pliers look like this so I Hope it helps. Click here for the diagrams quick link. Next week there are a few more jobs to be done, I hope the main task is the seats. Toby the Trimmer is on the case and should be done with them very soon. Fingers crossed. 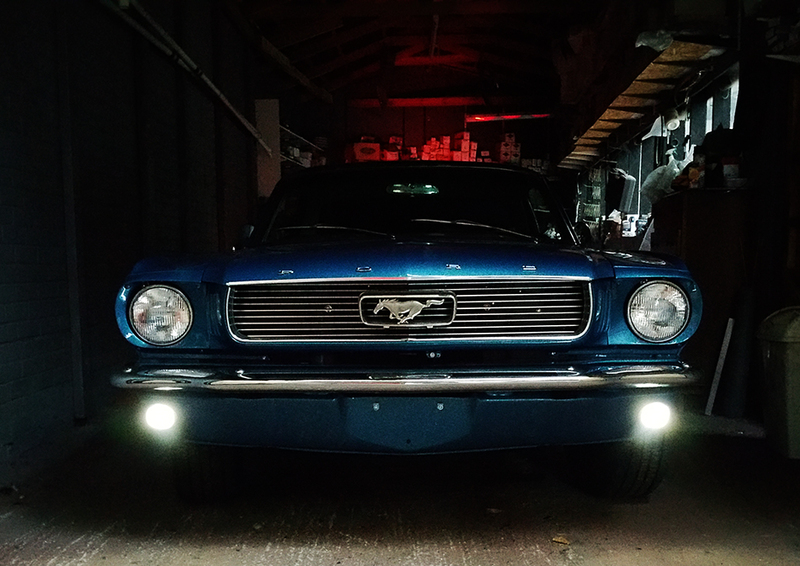 This entry was posted in Articles, Car, Photo's, Reviews and tagged 600cfm, dash gauges, Enos, gasket, gauges, GT dash, Holley, LED's, mirrors, Mustang, One man and his Mustang, pertronix, Sealey, Snap-On. Bookmark the permalink. Those LED taillights can be sequential (in indicator mode). Looks cool and not overkill at all. Thanks, more shiny bits to go yet. Thank you so much. It’s getting there, slow but sure.